Well, it is 2018 and once again office condos are being built in Jacksonville. These are the first ones built in this area since 2008. There are 16 new units being built on Greenland Road at the Greenland Road Office Center. There, are also 20 new units that are being considered at the intersection of New Berlin and Cedar Point Roads. Office condos are a great way to own rather than rent for your business and there is usually opportunity to grow within the complexes. Prices have started rising again and range from the $160k's to the $180k's. Now is the time to consider one for yourself or as an investment. The current vacancy rate in these type units is at an all time low. Call us today at 904-281-8100 and investigate your options. We also have several investment type units with good term tenants in place. It has been sleepy in the office condo arena. Not anymore! There hadn't been any built to speak off since 2007, but now things are starting to heat up. It started in St. Johns County with the development of Nocatee office units and with those in Palencia. They have been followed by new units in Bartram Park and Greenland Road. 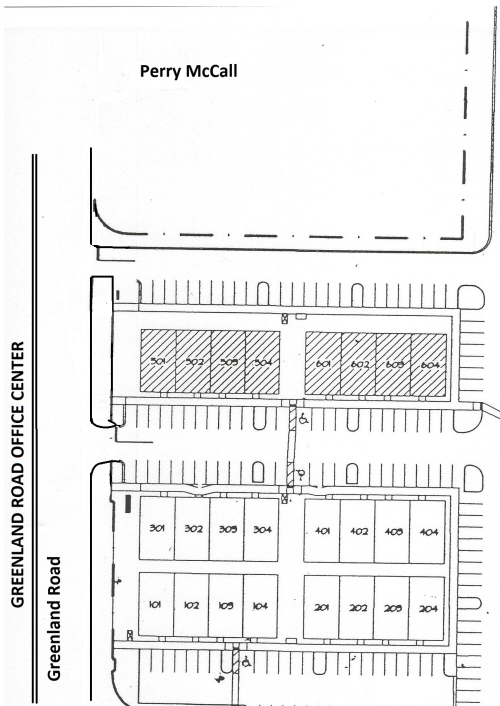 Greenland Road Office Center was originally designed as a complex of 150 office condo units. With the downturn in 2008, the Developer moved his operation to Texas where the office condo market was exploding and still is today. However, last month, he returned emphasis to Jacksonville and began further development at Greenland. The first builiding is halfway complete and is already half sold. Interest is brisk and there is a good opportunity that there will be a total of 24 units built at the site. Interest in the area is high because of the growth in residential areas along Greenland. The prices are still low and now is the time to take a serious look at getting one of these offices. We in the office condo arena were living high in the early 2000's.There weren't many of us in that arena because nobody wanted to "mess with those little deals." It was actually easy to show potential buyers that they could buy for less than they could rent andhave something to show for their efforts in the form of equity in something, rather than just paying rent that they would never see again. As things slowed somewhat in the commercial arena and agents were looking for anything they could find, the small deal market became very crowded. Then, when developers quit building office condos for the main part in the 2007-2008 time frame, the tempo to sell the remaining inventories peaked. Loans were easy to get. Life was good. Prices spiked. Condos were selling all over Jacksonville for over $200,000 a pop. Then came the "Bubble Bursting Years". People were unable to pay their mortgages that had been too easy to obtain and they began going underwater, bailing from their businesses and giving the units back to the banks or short selling them at big losses. That chaos went on for almost five years. We, at Jim Akers & Associates, Inc. have worked to try and rebuild this segment of the market. We began by encouraging people to lease their units rather than sell them, a strategy that we still recommend in many cases. This has resulted with the help of other agents to reduce the currently office condo leasing market in Jacksonville to less than 20 units. From sales prices that were in the middle $90k, they are recovering to the $135k's in the Mandarin Market, $150k's in the Southside area, and in the $160k-$170k in the units east of Southside Blvd. Now may be the time for condo owners who are ready to sell, to put them on the market again. Units that have tenants with longer leases are once again catching the attention of investors. They realize the prices are coming back and want to get back into the market for they get too high. If you are thinking about putting your unit on the market, we would like the opportunity to help. Just give us a call. There are actually very few units are the market for sale or lease. Now is a SUPER time for investors to get into the office condo market. Prices have not climbed as high as they were and there are very few lease units available so the rents have climbed. I always say that NOW is a good time to buy an office condo, but it is the truth. Just about any time is. There was the bubble where prices were unrealistically high, but that is long gone and the prices have stabilized where they were in 2003 and 2004. To the point that it is as cheap or cheaper to purchase as it is to lease. That is what we are seeing. More units are being purchased rather than leased. Why pay a landlord when you can be paying yourself and building equity? Very few units have been constructed since 2007, when the decline came, so absorption has been strong. Inventories are low, so the rental rates came back quickly. The sales prices are on the rebound, but have not risen as quickly as the lease prices. Time is running out on the bargains. Most of the steals are gone, already converted to rental units. Don't delay. Call the office and one of our associates will be happy to show you our listings. 2013 Is Looking Up - A Good Time to Buy Again! From the look of January statistics, commercial real estate is starting to make slow move in a positive direction. Call volume in our office, during January 2013 tripled from December. More importantly, the calls were inquiries "for purchase" rather than "for lease." During the "good" times it has generally made sense to purchase rather than lease. If you are going to be in business for 10 to 20 years, the amount that you give to a landlord in rent can be instead be converted to equity. That principle worked very well until the bottom fell out of the market. Those individuals that bought at the peak of the market were hurt, because they paid more for their property than it is work in today's market. Those who had purchased in the early 2000's have still done well and can sell their units at or above what they paid for them, and can enjoy the rewards. Most of the callers "want a bargain!". They want to cash in on the foreclosure market. Interestingly, the majority of those properties have already been snatched up by investment groups and REIT's and is being remarketed at or near the new "market rate." That will cause a somewhat slower start, but it does not appear to be stopping inidividuals who have already made the decision to purchase. Thanks for the SBA and the CDC's that are offering the 504 SBA loans, there is money for mortgages of owner occupied properties at really attractive rates. The rates and the availability of units is going to be a short term condition as the distressed asseets start selling. There will be a very narrow purchase window to get a good deal. Now is the time! Just do it! The first quarter of 2102 has seen a noticeable increase in the number of office condos being leased in all parts of Jacksonville. Prices appear to have finally stablized. This is due to the absorption of available units. There was very little construction of office space in 2010 or 2011 in the Jacksonville area. Lease prices east of Southside Blvd are almost back to 2009 levels. The slowest areas to recover have been the westside and Mandarin. The start of 2012 has seen an increase in the number of foreclosed units, something that office condos were fairly free from due to the lower price structure. Most are units that were purchased after 2008 when the prices had excelerated at the top of the bubble. The prices, in general, have returned to the price range of 2005. The prices of the foreclosed units in many cases are below where they were when the units were sold. These units are selling very quickly and have compromised the large majority of the units sold. Even the prices of foreclosured units are starting to stablize at the prices of units sold in 2004 and 2005. There are a few new developments which are coming out of the ground. Most notable, Greenland Road Office Center. When finished, Greenland Road Office Center will have 150 units spread over approximately 15 acres. The first building is completed and the second will begin soon. The parking lot has been poured and is ready. Units in the office park are currently prices in the $150's. Another park of note is Avenues Office Center, which is located at the southern end of Western Way where Southside Blvd and the entrance ramp to I-95 merge. The property is on a high bluff and will be a very scenic center with great views. When finished the office park will have 92 units. Sixteen of the units will have lake views. Office Condos are GOOD. I told you, but read this! Office building construction has slowed or halted in many parts of the country due to lease rates that have leveled off or declined and mounting vacancy rates. One bright spot, however, has been office condominiums, which have continued to gain in popularity. Last year, The Wall Street Journal's RealEstateJournal.com noted in an article, "Amid Low Interest Rates, Office Condos Multiply," that "while average office-rental rates in Manhattan have fallen about 30 percent during the last three years, prices for office condos have increased 50 percent during the same period." Skyline News & Research newsletter reported that "In Florida, Arizona, Minnesota and cities such as New York, Atlanta, Washington, DC, and Los Angeles, commercial condominium development has yielded high returns for investors." Why Has This Market Segment Done So Well? Office condominiums are also an attractive option because many cities have an under-supply of small buildings in the 1,000- to 5,000-square-foot range available for purchase. For example, according to the Skyline News & Research newsletter, tenants with space requirements of less than 10,000 square feet comprise 80 percent of the marketplace in San Francisco. Office condominium developments, which typically offer space from 1,000 to 10,000 square feet, can help to satisfy this unmet need. As with any real estate development, the most important element for success in developing office condominiums is location, location, location. Most projects are located in highly visible locations with great accessibility and accessibility to a freeway. Since many purchasers are medical professionals, the ideal location is on a major thoroughfare, close to both a freeway and a major medical center. Because office condominiums are a long-term investment, it is vital that they are built in areas that will appreciate or retain their value for at least 10 to 20 years. Existing office tenants who want to stay in a convenient location for their patients, clients or customers are an excellent source of future office condominium buyers. Nearby residential neighborhoods should be populated by white-collar workers with higher than average annual incomes. Not only do these demographics support the long-term prosperity and desirability of an area, but also, local business owners often decide to reduce their daily commute by buying office condominiums near their homes. The needs of small and mid-sized established businesses are often more specific than those of larger companies. They are more cost conscious and do not want to purchase excess capacity. This requires working very closely with potential purchasers to help them design a space that will meet, but not exceed, their current and future needs. Small and medium-sized businesses may not have the in-house resources needed for the due diligence required to get the best deals and are vulnerable to being short-changed in the market. The buildings are designed to easily accommodate three to four tenants per building. To accommodate multiple businesses, Each tenant has a separate entrance, easily seen signage and separately metered utilities. The roofing, windows, walls and heating/cooling systems are designed for energy efficiency. Successfully completing projects and developing a track record of quality construction and sales performance. Communicating frequently with local brokers. Sending direct mail marketing pieces to local businesses. Cross-marketing multiple properties and projects. Although office condominiums don't work everywhere, they have evolved from a niche into a mainstream product. With net annual returns ranging from 15 percent to more than 40 percent, the likelihood of continuing low interest rates and the pent-up unmet demand for the long-term financial benefits that office ownership provides to small and mid-sized businesses, the outlook for office condominiums is extremely positive. , the largest developer and broker of office condominiums in the United States. "Although office condominiums don't work everywhere, they have evolved from a niche into a mainstream product." "Office condominiums are uniquely positioned to meet the needs of small to mid-sized businesses, usually professional service firms, small businesses and entrepreneurs. " Office Condos, A Good Place to Start Buying Commercial Prop. If you read the paper or get on-line newsletters, you will continually hear that the sky is falling on commercial real estate. The truth is, that the market is soft, REAL soft, but there are people buying and selling commercial real estate. With everyone so paranoid about the future, most folks are opting to lease rather than purchase. This has been good for the office condo market. There are lots of bargains on the market that allow a buyer to get in for relatively small dollars and lease the property for small gains. Not the profit margin of three years ago, but allows the owner to carry the property with a positive cash flow while they are waiting for a rebound in the market. The vacany rates in office condos, in our market, are lower than general office numbers. The leases are not as lucrative as they used to be and they are not as long as they used to be. The normal average length of an office condo lease used to be 3 to 5 years. Now, they are 1 to 2 years. People are nervous and afraid to make the committment for longer. That is understandable. Where are the tenants coming from? When people were laid off or fired in 2007 and 2008 and unable to find someone to hire them back, many started their own companies, working out of their homes. The one's that were successful and have businesses that are growing, outgrow their home offices and look for other venues. Office condos are the of a size that is affordable and a great first step. Many of those forced entreprenuers are looking for just a couple of offices. Most of the condos that have been built have 4 to 5 offices. This scares many potential tenants away, but a number of condo owners are subleasing their offices to other professionals, reducing their overhead, and filling the office. As their companies grow, they either take more offices within the unit for find new units to rent or purchase. Some opt to purchase an entire unit and sublease it until their company grows into the space. Will the market rebound soon? Probably not. Estimates are three to five years before the growth returns, and we will probably not see the kind of growth that we had in the first decade of the century. But if you have the capital or borrowing power, you many want to consider looking at an office condo. If you just want information, give me a call at 904-281-8100. The Financial Accounting Standards Board (FASB) is considering a new proposal (#13) Accounting for Leases, If it is approved, rent payments would go from being recognized as an operating expense, which doesn't appear on a corporations balance sheet, to a capital expense, which does appear. This would alter the way that companies show rent costs on their balance sheets, thereby cutting into profits. It would cause corporations, in the name of financial transparency, to carry a reserve equal to the amount of rent over the entire lease term. (So much for 10 and 20 year leases!) This amount would show as a balance sheet liability. That makes it just as easy and smart to buy, particular now that prices are at a 10 low. If a company wants to control a particular space for 10 to 20 years, it makes more sense to purchase. This allows the company to depreciate the building over 39 years instead of just over the length of the lease. The announcement came out to inform larger companies, but smaller companies can benefit as well. Since they can't or do not want to buy a large building, an office condo is the perfect alternative, and we can help you with that!! An office condo is is a great option when it comes to the purchase of an office property. The price of land is still high and even a small building of around 3000 square feet can cost up to $1Million dollars. An office condo of equal size will cost less than half as much. With an office condo, the maintenance of the grounds, roads, driveways, roofs and the outershell of the building is usually the responsibility of the association. The association also carries liability and property-casualty insurance for the common areas and the building itself. Operating costs for your business are lower from the economy of scale and cost sharing amongst the other units. If you are developing your own business after a corporate restructuring, you may be able to get a lease/purchase option. In the first couple of years, you can build your business and then be able to show banks a track record. With so many people in the process of starting new companies, there are great possibilities of subleasing individual offices to other professionals and thereby reducing your overhead, if you do not need the entire space. We know how to do that, and can show you. Purchasing at current prices also make more sense than leasing over a long term because there are such great deals available. If you are going to be in business for 10 to 20 years, the cost savings for purchasing are considerable and can reach into six figures. If you would like to hear more about the advantages of buying an office condo, call our office at 904-281-8100. Or if you have questions, you can contact us at spoci@bellsouth.net. If you currently own an office condo and need to sell it or come up with additional cash flow, we would be happy to speak with you about your options. Just call us!